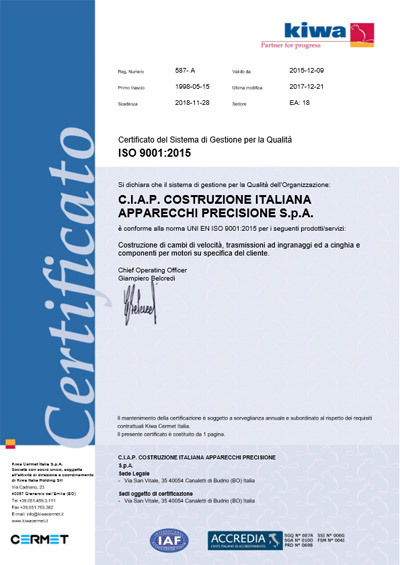 CIAP S.p.A. works in the field of manufacturing speed variators, gear transmissions and engine components built to the customer’s specifications. It also manufactures and assembles other components in the automotive sector and in other sectors too. Our organisation needs to demonstrate the ability to supply products on an ongoing basis that meet the customer’s requirements and the applicable statutory regulations. In accordance with the corporate strategies, CIAP has set out its company policy with regard to the principles of the BS OHSAS 18001:2007 Standard on matters of health and safety of employees and the UNI EN ISO 14001:2004 Standard regarding management of the environment. ensuring Environmental Management in order to guarantee correct control, in the interests of an increasingly extensive and shared eco-friendly view of its activities, aiming to significantly reduce the impact on the environment, preventing at all times any risks to the environment, even beyond the demands of the applicable laws. 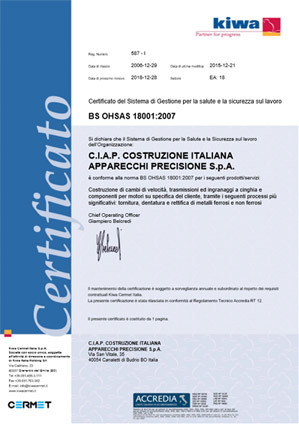 The Directors of CIAP undertake to comply with the environment and safety laws, to limit risks and to prevent accidents, analyse all the causes of dangerous situations, limit and prevent forms of pollution, optimise the handling of waste, limit the consumption of natural resources, to train and inform employees on the safety and environmental rules and to ensure continuous improvement of the company’s performance. CIAP applies the management system to all its activities.